Various locations - Check sponsor's website for latest updates. NOTE: Dances scheduled approx. once a month (usually Friday or Saturday). Dates & locations vary. Check sponsor's website for latest updates. 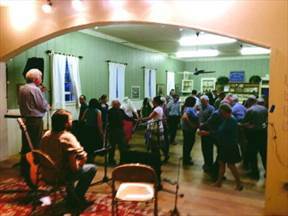 Old-time reels, mixers, squares, and waltzes to live fiddle/banjo music. All dances are taught and are beginner/family-friendly. Dances are easiest earlier in the evening and become more complex as the evening progresses. Come alone, bring family/friends/kids and join our mix of beginners and welcoming seasoned dancers. No experience, partner or special shoes required.